This is another rare Saturday special. I am not going to start working on posts early Saturday morning. The egregious events connected with the Synthetic Floater GJN have caused me to reassess my extremely small exposure to them. I will note in Monday's post that the trustee for GJN is claiming that Wells Fargo gave it the number for its termination fee. While I did not own GJN at the time of redemption, I am doing what I can to help those folks. 1. Sold 100 GYC at $22.22 Last Friday-Roth IRA (see Disclaimer): In light of the egregious events connected with the liquidation of GJN, I have been reassessing my small positions in synthetic floaters. Sold 50 JBK at $22.75/Reassessment of Current Synthetic Floater Positions; The Egregious Swap Termination Fee Paid to the GJN Swap Counterparty The comment section of that post has material relevant to my ongoing evaluation process. I am now down to 150 shares of GYB, 50 shares of GJR and 50 shares of GJT. All of those securities have $25 par values and all are currently trading below $17.52. The GJN swap counterparty took almost $11 as its swap termination fee leaving the GJN owners with $14.6857 per certificate sold by WFC/Wachovia at $25 to public shareholders. I am keeping 150 shares in a family members account, where the unrealized profit for those remaining shares is less than $100 after trading the security. Each investor needs to make their own informed decisions after evaluating the risks. The screwing of the GJN TC owners is now a known risk. Due to the abnormally low short term rates, this security has been paying its minimum coupon since my original purchase in May 2009 and will likely continue doing so for at least two more years. Consequently, GYC will likely be a low yielding security for several years. The three month LIBOR rate will have to exceed 2.6% during the relevant computation period to trigger an increase in the minimum 3.25% coupon. At $22.22, the yield at 3.25% is about 3.66%. The profit on the shares is worth more to me than that coupon yield. I will now try to discuss as clearly as possible the GJN issue in relation to GYC. First, it is important to keep in mind what triggered the redemption of GJN and the outlandish swap termination fee paid to Wells Fargo, the originator of the Grantor Trust via Wachovia. The precipitating event was J P Morgan's decision to redeem the underlying trust preferred security, a trust preferred security maturing in 2035, that was bought by Wells/Wachovia and sold to the trust created by it. 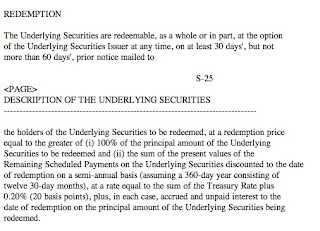 And, importantly, JPM relied on the "capital treatment event" exception and refused to pay a "make whole" payment in connection with that redemption. You will not see "capital treatment event" exceptions to make whole payments in senior bond prospectuses. That type of event is relevant only to trust preferred securities that used those securities as Tier 1 equity capital before the passage of the Dodd–Frank financial reform legislation and will have to phase out that use. It is the phase out of TPs as Tier 1 equity capital that is the so called "capital treatment event", though there is a question of "when" that event occurs. Item # 1 When Does a Capital Treatment Event Occur I would not assume that a court or jury will agree with JPM on that issue. What is a make whole payment? It is compensation to the bond owner triggered by the issuer's optional redemption. Think of it as a penalty that issuers would ordinarily not want to pay. While the calculation will vary from prospectus to prospectus, usually on the discount rate to calculate present value, the starting sum is the total amount of interest payments remaining in the term and the principal amount, discounted to present value. JPM would not have redeemed the TP in GJN if it had to make that make whole payment. It would have been crazy for them to do it. The underlying bond in GYC is a senior AT & T bond maturing in 2034. 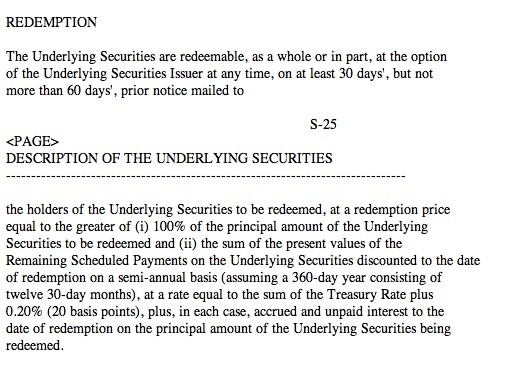 FINRA The prospectus for the underlying bond contains a make whole provision. Prospectus Supplememt (page S-11 to S-12). As the reader can see, this would be a substantial payment when there are a large number of scheduled payments remaining in the bond. This is why I doubt that AT & T will call the underlying bond anytime soon. The bond prospectus has the same swap termination payment provision as GJN which is cause for some concern. What if, unexpectedly, there is a trust termination event for some other reason, unrelated to the redemption of the underlying security, that would be classified as a default by the trustee? Those other events are described at page S-32 of the prospectus. Some of them deal with events characterized as swap counterparty defaults, where even an immoral Master of Disaster would not claim a right to compensation for their own default. What if AT & T declared bankruptcy, would the swap counterparty make a claim on whatever may remain after the bankruptcy reorganization? I do not know. Since I assume that Masters of Disaster will always try to line their own pockets with other people's money, until proven beyond a reasonable doubt otherwise, that would be a matter of concern. But, in that circumstance, the owners of the TC would have already lost most of their money, since the risk of an issuer default rests with them. 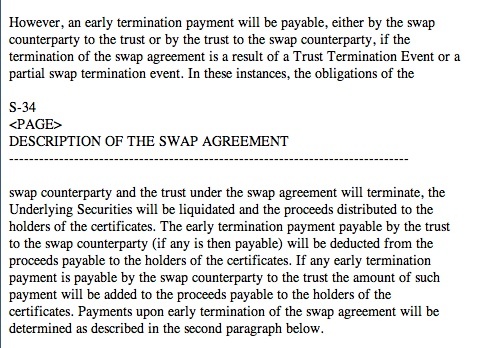 The swap counterparty for GYC is UBS who is also the calculation agent for the swap termination fee. I wonder if these knuckleheads even realize that they are dealing with individual investors who are third party beneficiaries of a trust created by them. Before the issue of the termination fee is even reached, it would first have to be determined by the appropriate fact finder (e.g. court or jury) that the swap counterparty could invade the redemption proceeds when the result would be to pay the third party beneficiary of the trust less than $25. Assuming more than three quotes were obtained, what were those dealers told about the GYC swap agreement and were they told who would benefit by the quote? Would you trust the number? Do you trust these people in the least to do what is right and fair? I am sure they will tell you with a straight and earnest face, while wearing their Armani suits and obsessing about their multi-million dollar bonus pools, that they are honest people with impeccable morals, and are offended by any suggestion otherwise. How does one go about calculating for the next 23 years the value of a swap where UBS pays the greater of 3.25% or .65% above the 3 month LIBOR rate up to 8%. The 3 Month LIBOR has historically been all over the place. An average rate over the past 23 years would be close to 5%. There would likely be several years when UBS would have to be dipping into its own pocket to make payments since the fixed coupon of the 6.45% AT & T bond would not cover it. Now, if the estimate was made in bad faith, the number could be even greater than the outrageous fee paid to Wells Fargo originating from GJN's trust termination event. Why? The main reason is the that the AT & T bond has a higher coupon than the JPM TP. Another catalyst for an outlandish estimate would involve the potentially over estimating the impact of a .65% spread over 3 month LIBOR compared to GJN's 1% spread over the three month treasury bill. Over long periods of time, that difference might be close to equal. However, if your calculation assumes that the .65% Libor spread would create more of a spread for the swap counterparty over the life of the agreement, than you could even come up with a higher number. There is certainly room for mischief. If there is room for a Wall Street Dickhead to screw you, it would be advisable to assume that you will be screwed. The implied term of good faith and fair dealing is not exactly part of their repertoire, as shown over and over again by events during my lifetime. I quit counting after a million. On balance, at least where there is a significant unrealized percentage profit, I do not think GYC is worth the trouble given its low coupon and the current price relatively near its $25 par value. The GJN situation is a matter of some concern, though not so much for an early issuer redemption with a make whole payment. The bankruptcy of the issuer is an outlier type of event. 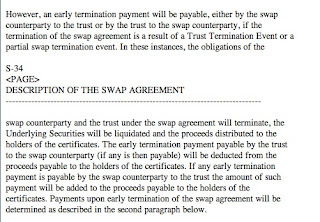 The synthetic floaters with long maturities have more potential downside risk, as shown by the GJN event, in the event of an early trust termination/swap termination event where no make whole payment is made by the issuer.